Quarterback Marcus Mariota ran in a score and threw for another in the Tennessee Titans 24-13 victory over division-rival Houston Texans. Second-year running back Derrick Henry recorded 109 yards on 11 carries, including a 75-yard touchdown run that clinched the game with just 0:57 seconds remaining in the fourth quarter. Texans QB Tom Savage was tasked with a lot against Tennessee, attempting 49 passes to the tune of 31 completions and 365 yards but their rushing attack mustered just 53 yards on 22 carries in the loss. With that, we give you our PFF-exclusive takeaways from the contest for each team. It was a solid performance by the third-year quarterback, as his offensive line did a marvelous job protecting him. Under pressure on just six dropbacks, Mariota was sacked twice, ran for a first down and didn’t complete a single one of his three attempts, but he shined when passing from a clean pocket — 15-for-20, 150 yards, 1 TD, and a passer rating of 112.5. Mariota kept it safe for the majority of the game, throwing deep just three times completing none. When looking Walker’s direction, Mariota was a perfect 5-of-5 for 63 yards and a touchdown, resulting in a perfect 158.3 passer rating. On two big-time catches on the drive gave Tennessee took the lead for good, Walker spread out where he did his damage as each of his passes was caught against a different defender in coverage. He was excellent as a run-blocker once again as he continues to be one of the better run-blocking tight ends in the NFL. While Cyprien was charged with Houston’s lone touchdown on the day, he was otherwise excellent throughout. 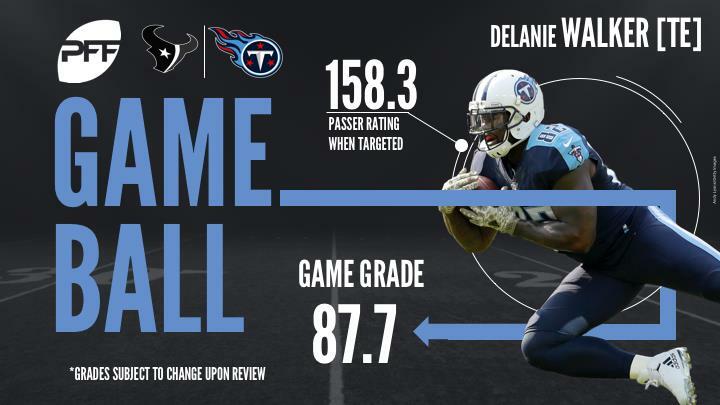 He gave up just two receptions for nine yards on five throws into his coverage, and led the Titans with a run-defense grade of 88.6. Ryan’s grade may be average, and his day ended early due to injury, but Ryan held his own against one of the best receivers in the game. Charged with covering DeAndre Hopkins 1-on-1, he gave up just five receptions for 44 yards on nine throws into his coverage against Houston’s top weapon. Of the four incompletions, he batted away one pass and was in position with blanket coverage on each of the other three. With so many of Houston’s receiving weapons out of the game due to injury, the Titans were often able to double-up their coverage on Hopkins. While he was forced out of the end zone on a would-be touchdown on the first possession of the game for the Texans, he still had a productive day. For the game he managed eight grabs for 80 yards on 14 targets, making this the eighth game of the season in which he’s seen double-digit balls thrown his way. Allen was solid on run blocks (77.7 run-blocking grade), but as expected considering he was playing out of position at left tackle, he had significant struggles in pass protection. He surrendered five total pressures on the day, and on a critical fourth down late in the fourth quarter took three consecutive false start penalties. The Texans have needed to rely on their former No. 1 overall pick this year with the injuries that have struck the defense and he’s lived up to the billing for the most part. However, against division foe Titans, Clowney was neutralized as a pass-rusher for all but one play where he beat Taylor Lewan resulting in a holding penalty. Excellent against the run, forcing cuts and recording a run stop, Clowney did get flagged for three offsides penalties, resulting in an average overall grade. The Texans defense didn’t have any standout performances, but Jackson was the best of the defensive backs in coverage as he forced two incompletions and allowed just two catches for 33 yards in the game. Jackson averaged 11.5 cover snaps per reception, a major improvement over his season mark coming into the game allowing a reception every 7.3 cover snaps.